Our largest species of deer, and in fact our largest land animal, is the red deer. Named for their beautiful reddish brown summer coats, red deer are native to the UK and are a herd animal preferring to live in woodland with open rides. However, as humans have altered the countryside over the centuries, they have adapted to living on moors and heaths, though the red deer of the Scottish highlands rarely grow as big as their cousins in the lowlands. Red deer are found across the UK, and are best recognised by the combination of their large size (they are big! ), their buff rump and short tail. They’re also likely to be seen in herds rather than on their own. Reindeer are by far the most familiar deer species to me, because this is the species we care for here at the Centre. Reindeer were once found free-ranging across much of the UK, but died out due to the pressures of over-hunting and climate change at least 1000 years ago. 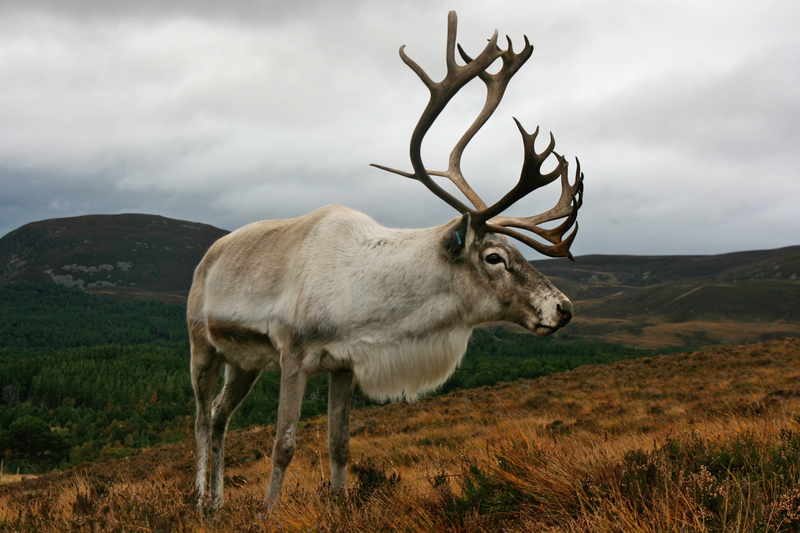 Our small herd were reintroduced to the Cairngorms in Scotland in 1952, and around 150 reindeer now roam the mountains here. As the only British deer species to be adapted to Arctic conditions, they are comparatively stocky and dumpy, and tend to carry their heads below the horizontal. Their colour ranges from pure white to almost black – variation caused by thousands of years of domestication – and both males and females grow antlers. For most people, they are an easy candidate to rule out, as they are only found roaming in the Cairngorms in Scotland. 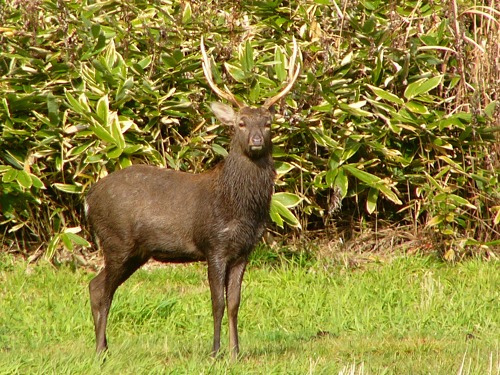 Originally Japanese in origin, Sika deer were introduced to the UK from 1860, and can now be found in patches right across the country, though their stronghold is in north-west Scotland. 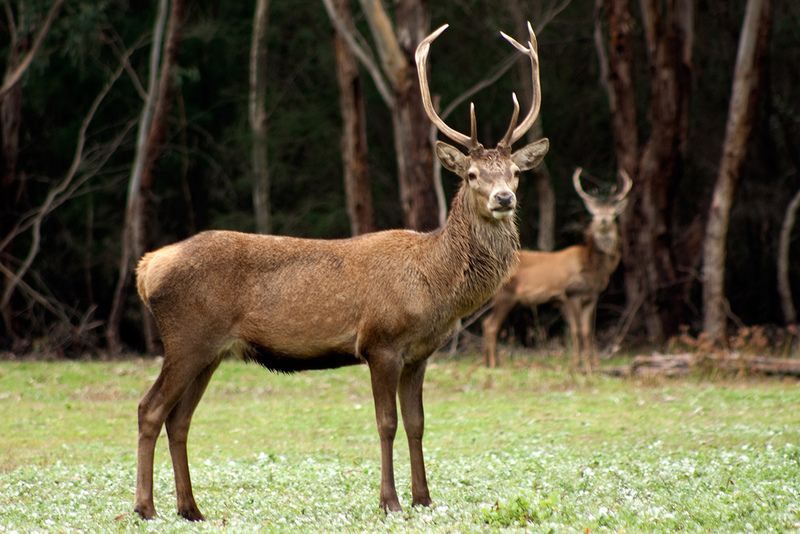 They are similar in appearance to a red deer at first glance, but are slightly smaller, have a dark dorsal stripe and a much darker brown winter coat. Their heart-shaped rump patch is bright white, compared to the buff colour of a red deer, and for much of the year they are solitary, though they will form small groups of 6-7 in the autumn and winter. 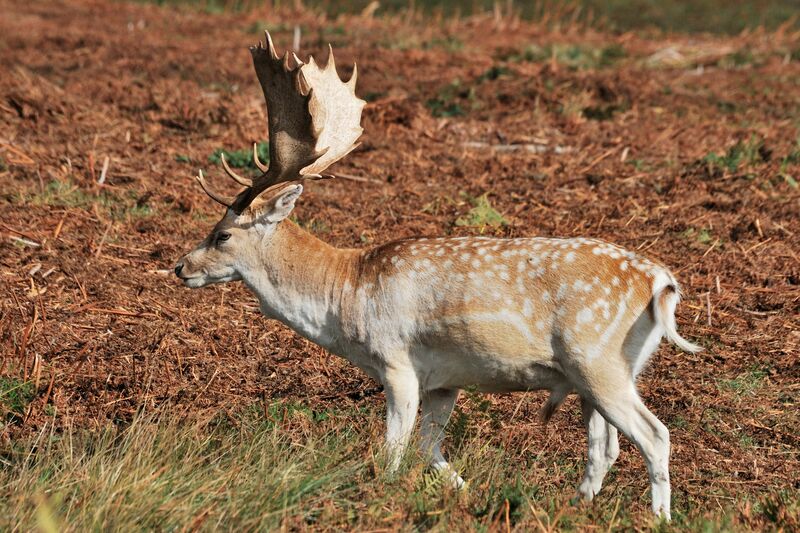 The stereotypical “spotty” deer, fallow deer are a common sight grazing in the grounds of stately homes and parkland. There is evidence that fallow once roamed Britain around 400,000 years ago, but today’s population has resulted from escapees from parks. Fallow bucks grow lovely ‘palmate’ (flattened) antlers. The familiar tan “menil” form with white spots is just one of the colours that this variable deer comes in, whilst some individuals are white, some are dark brown with spots that disappear in winter, and some are completely black. The noticeable trait which is the same for all of these colourations is a light coloured rump patch edged with black, with their long tail appearing to split it into two. The dainty roe deer is another of our native deer species, and perhaps the one you are most likely to spot in woodland and gardens right across the UK, with some individuals becoming incredibly tame due to living in close proximity to humans. The species was driven close to extinction in this country in the 1700s due to overhunting. Roe deer are usually seen alone or in small family groups, are a solid brown colour with a small rump patch and don’t have a noticeable tail. They will ‘bark’ if alarmed, which can be mistaken for the yap of a dog. Chinese water deer are a primitive species – instead of growing antlers the males grow tusks which can be seen protruding from their mouths. They were introduced to the UK within the last 150 years and have since become established across the Midlands and East Anglia. As their name suggests, their preferred habitat is fens and wetlands, and they are usually seen alone or in small family groups as they are territorial. 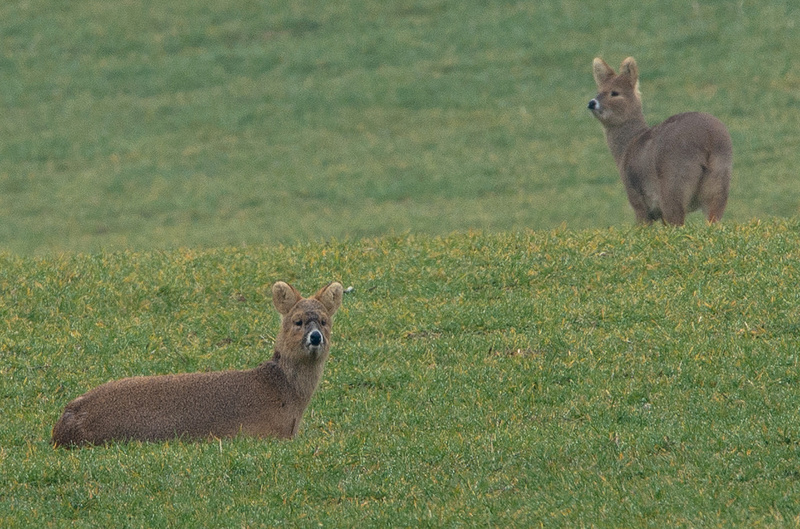 The most obvious differences setting Chinese water deer apart are the lack of antlers, large mobile ears and the absence of a rump patch. The smallest of our deer species was introduced around 1900, and is now well established across most of England. At first glance, it would be easy to mistake a Muntjac for a small dog, or perhaps a large hare, as they tend to have a peculiar hunched stance. Muntjac are usually seen alone or in small family groups, and the males are often heard rather than seen as they bark persistently when rutting. 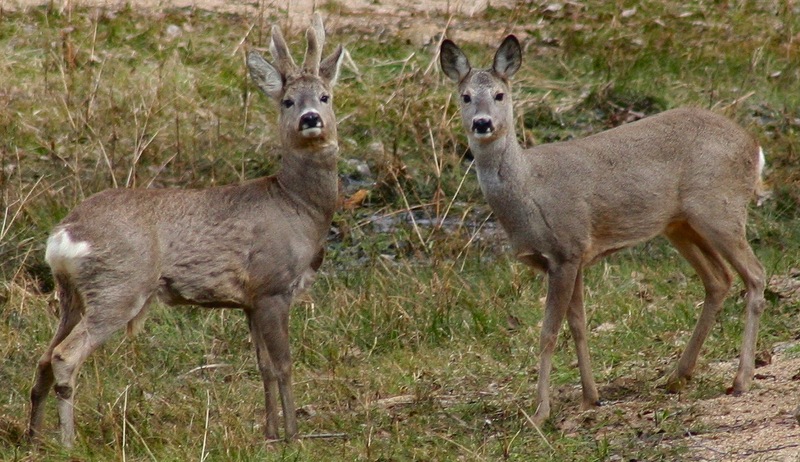 Along with the male’s small antlers, both sexes grow tusks, and as they aren’t seasonal breeders, does can be seen with a fawn at any point of the year. 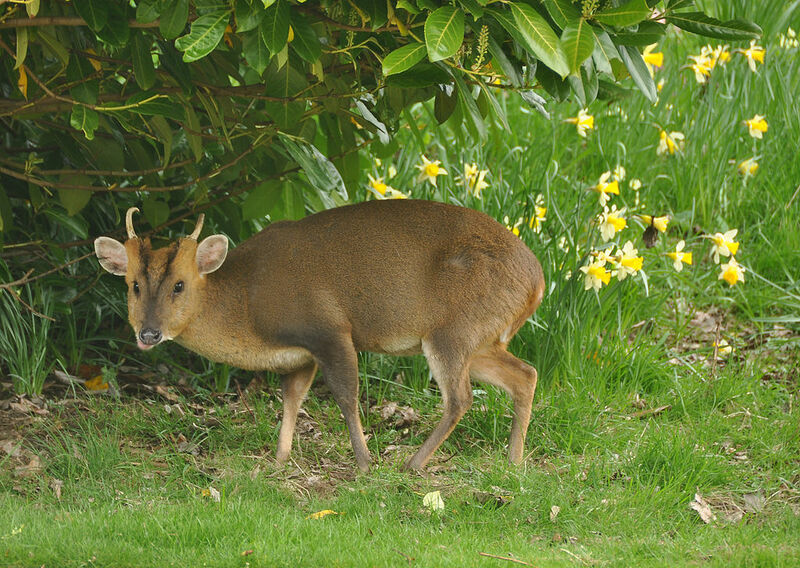 Their tiny stature (think collie-dog size) and hunched posture makes Muntjac easy to distinguish. So there it is, from the largest to the smallest, the seven species of deer that you may encounter in the UK. Hopefully this has helped make the thought of working out who that disappearing rump belonged to a little less daunting! Keep your eyes open, even in parks and gardens in towns and cities, and perhaps you may be surprised by one of these beautiful animals.